***I received the following product in hopes I would share my honest opinion with my readers. Regardless, all thoughts are my own, and all images are copyright Momma Told Me Blog 2015. Momma Told Me: Don't judge the cereal by it's prize. How do you make a product people already love and use stand out as a brand in a sea of equally colorful and engaging products? Why, you put something equally exciting, a bonus we'll call it, inside the product to delight consumers long after the point of purchase. Kellogg's was the first to do this, in 1945, when the inserted a pin back button, promotional item, into the boxes of their Pep cereal. Of course the creator of Cracker Jack, a German immigrant named Fritz, was truly the first to incentivize product consumption with this method in 1912. Regardless, today's consumers are just as thrilled to enjoy products which promise the immediate satisfaction of a trusted brand and product with the delayed reward of a hidden incentive. And so the industry, of candles with jewelry inside, has become quite popular in recent years. 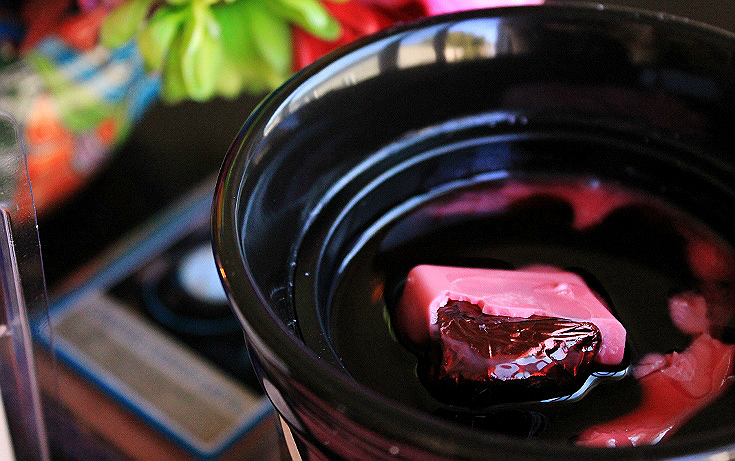 It's not a little known secret that there are many brands using wax to he trinkets and jewelry as motivation to buy their products. One of my first product features here on Momma Told Me was for the first major company to do this, and still remains one of my largest search engine traffic sources to this day! But not all that is original or 'first' is the best at what it does. I especially love it when a new craze or trend is saturated in the marketplace, represented by multiple sellers and brands. Not only does this breed competition, which is good for prices, but creativity, which means forward movement on concepts. For yeas now I have bought candles with jewelry inside as gifts for family members. In the beginning I heard about how exciting the experience was, how high quality the candles were, and how gorgeous the jewelry was- however, the 'jewelry' pieces were rings, and most often did not fit the actual recipient. Jackpot Candles has fixed that problem by offering a range of different jewelry surprises in their wax based products, from rings and necklaces to even earrings. This way you can feel most confident your recipient will be able to wear the piece found inside their gift. Even more exciting is the opportunity to order select fragrances and products in certain jewelry sizes- these products will come with a simple numeric 'size' sticker on the bottom, so you can gift the ones you love something that is guaranteed to fit. Of course the item inside will still be a surprise! 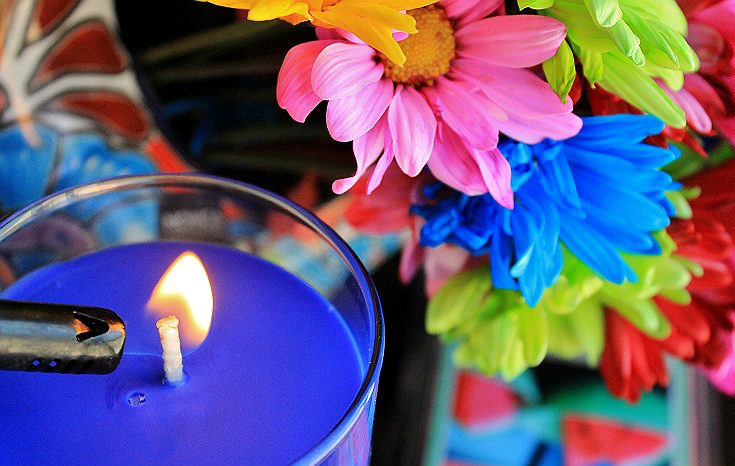 Jackpot Candles have not only taken some of the improbabilities out of ordering mystery candle gifts, they have dedicated their brand to 100% soy, hand poured, quality products made exclusively in the USA. Many similar operations have moved overseas, so I am happy to continue to support a USA based business. Every August, for my cousin's birthday (which happens to be the same day as mine) I head online and order 2-3 pieces of mystery candle gifts in my cousin's size. I first gave her a jewelry candle gift 3 years ago for Christmas and she still has not stopped raving about how she loves them the most. Her only complaint? She is impatient and seldom wants to wait for a candle to burn half-way down to discover her gift inside. 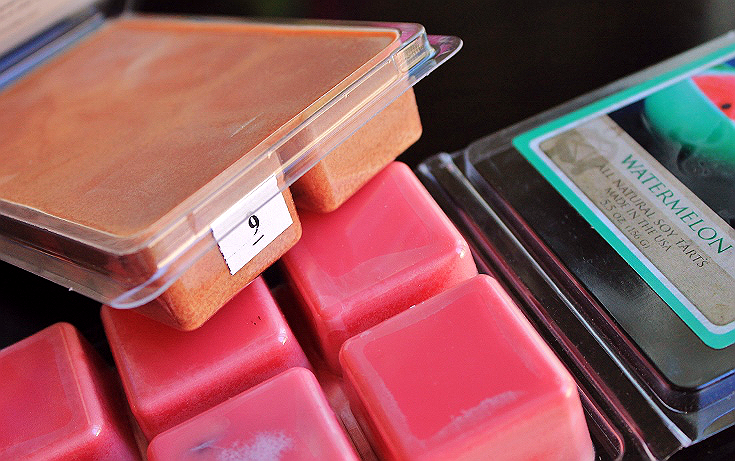 Jackpot Candles' wax tarts are the perfect solution, and a great gift for a flame free home. 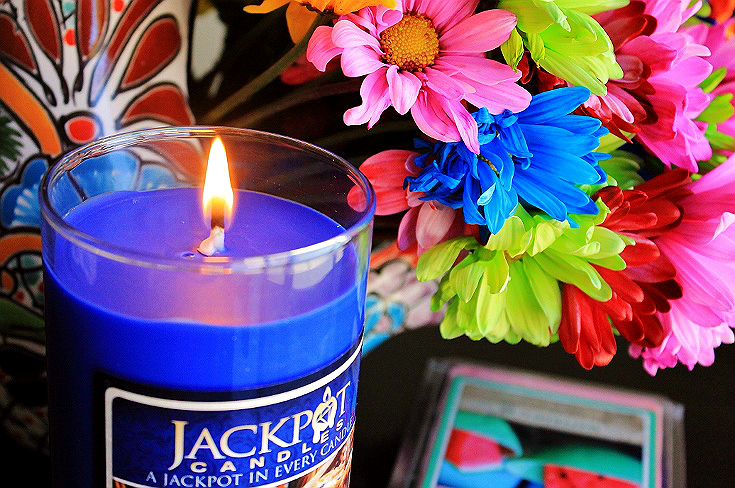 I recently had the chance to explore the range of vivid fragrances in the Jackpot Candles collection and fell in love with the playful juicy Watermelon tart fragrance and the rich, fresh baked, Blueberry Muffin aroma. I'll admit, I tend to be impatient too, so having the wax melts on hand for an immediate treat was wonderful, while the anticipation of the 16oz candle burning made me feel a little like a kid again! 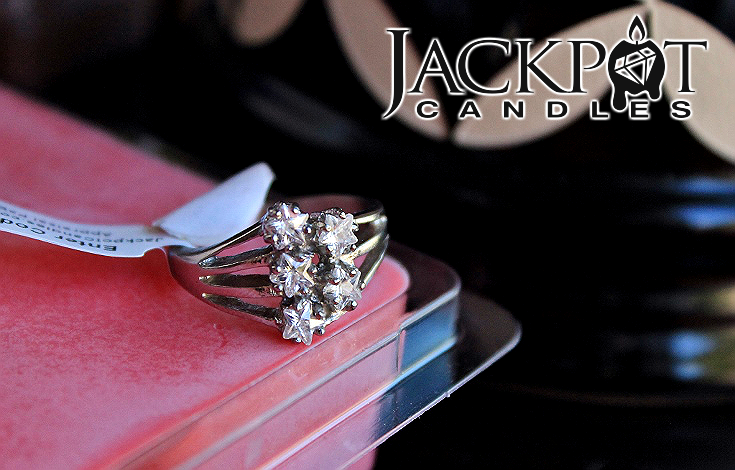 Jackpot candle jewelry is assured to value between $15-$5000. While I did not find a $5000 trinket in any of my pieces, I did enjoy the tracking code on each piece, where I could easily look up the appraised value, and composition of, my piece online. 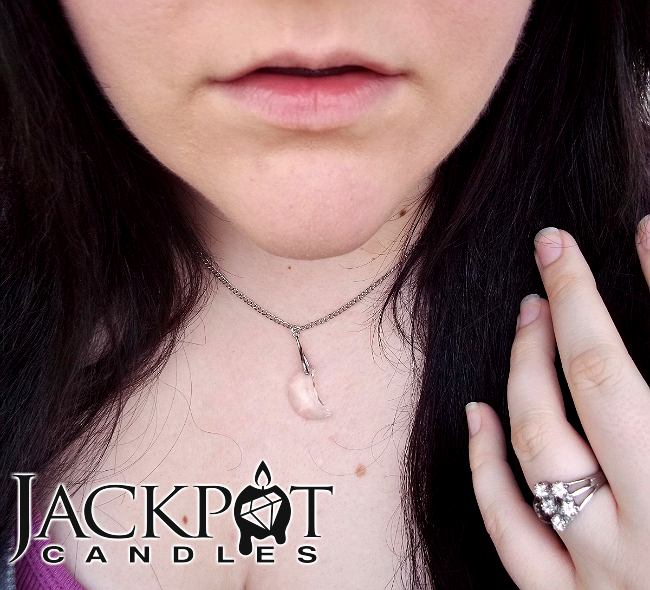 In all, Jackpot Candles has been one of the more affordable brands offering this jewelry in wax gift trend, and I found the quality of the products, and variety of fragrances, at the top of my list. I would love to see them expand into a candle-of-the-month plan, or even soap and fragrance beads, but the brand is fairly new and still growing. Lastly, something that seems to be sorely missing in this genre of gifts is an unscented line of wax candles with jewelry inside- I know several people with fragrance allergies who would love the ambiance and experience of a Jackpot Candle but cannot enjoy them quite yet. If you are not scent challenged, however, I highly suggest picking up a few of these gorgeous candle gifts while they have your desired sizing in stock! What Daughter Says: With unique, sized, jewelry in a quality soy wax candle product, there's not disappointment from start to finish. 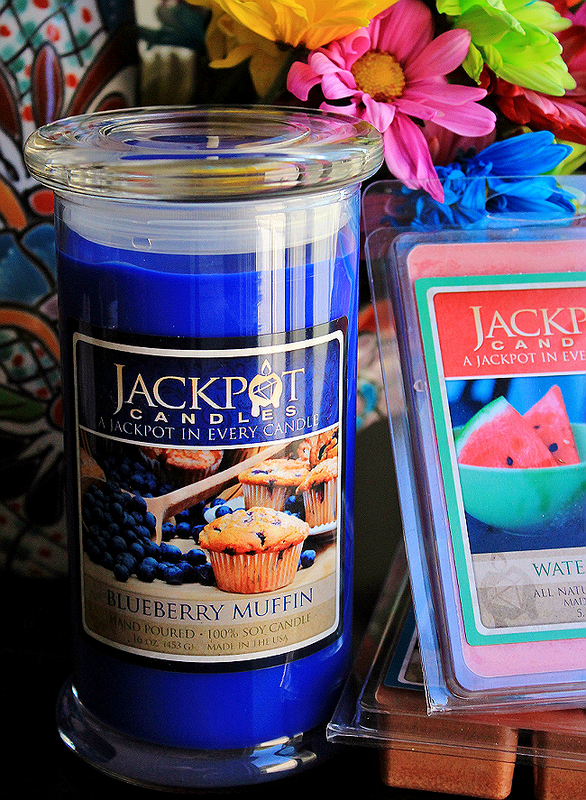 One Momma Told Me reader will win a Jackpot Candles prize pack including a Candle and Tart Pack in the fragrances of their choice. I'd love to try the Caramel Coffee Latte Jewelry Candle! Very interesting. I've never heard of anything like this! I'd like to try the Banana Nut Bread candle - it sounds like it will smell delicious. I lose my patience too - it's the kid in me I suppose. I've stopped burning candles though due to a.) the hubby's allergies and b.) the cats' tails. No melts either due to a. Bummer 'cause I used to love to burn something after dinner at night. Watermelon sounds so refreshing. Oh wow what wonderful fragrance. I think I would go for the Cucumber Melon. Oh Sweet Pea would surely be a favorite, I'd love to try that one. Although, the Blueberry Muffin sounds pretty nice, too. I would like the cinnamon bun candle. I would love to try the Vanilla Cupcake! My kiddo's would be thrilled if my house smelled like cupcakes every day! I would like to try Sweet Pea. OH I would love to try the Cherry Blast! Although....they all sound so good! The Cinnamon Sensation sounds like it would smell amazing! I would really like to try the vanilla cupcake jewelry candle. I think I would like it a lot. I would like to try the Ocean Breeze scent the most. I would like to smell the Lilac scented candle. It is finally time for Lilacs to be budding soon and I can't wait. I'd most like to try the Vanilla Cupcake candle. Thanks. I was going to say that I would want the cucumber melon scent...and then I saw the Georgia Peach scent! I would want that one the most. The candle scent I'd love to try is georgia peach. 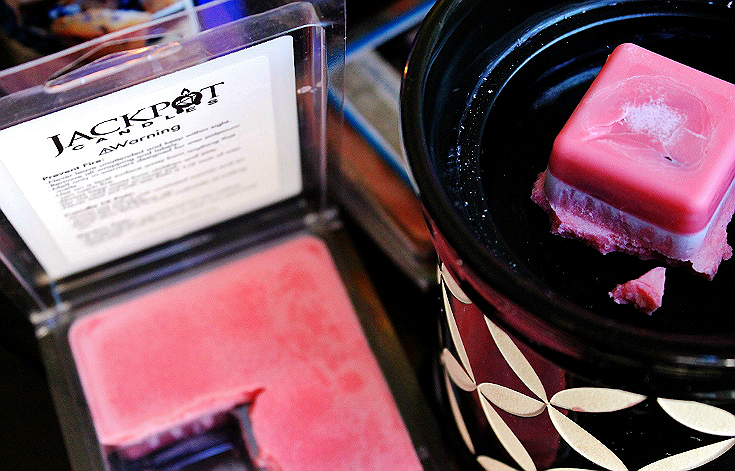 Tropical, beachy scents are my favorite, especially this time of year. I would love to try the Ocean Breeze jewelry candle.